Following yesterday's announcement that Sony will be sharing Spider-Man with Marvel Studios, opening up the wall crawler to appear in the Marvel Cinematic Universe, more details have surfaced regarding this huge piece of news. First up, The Wall Street Journal are reporting that Captain America: Civil War will be the first appearance of Spidey in the MCU, a move everybody guessed from the off, especially considering the character's importance to the storyline in the comics. There are no details on the ol' web head's role in the second Captain America sequel just yet, but rumours are circulating that it was set to be the debut of Chadwick Boseman's Black Panther in what is described as "a big part" of the film (possibly filling the being the movie's Spider-Man counterpart when the character wasn't available to Marvel Studios), so time will tell if Spidey's involvement will see this change. It is highly possible Spider-Man will just be used in an extended cameo, a la Hawkeye in Thor, keeping fans wanting more until his solo outing in 2017. 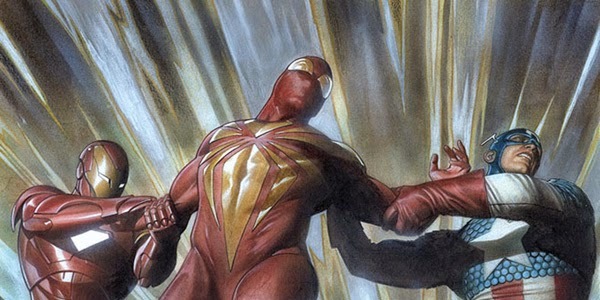 As for who will be donning the red and blue, Variety are reporting that Andrew Garfield is indeed out of the role, with Sony wanting to go younger, putting Peter Parker back in high-school, effectively ending their plans of an Amazing Spider-Man trilogy (thought there are reports that the Sinister Six and Venom spin-offs are still moving forward). A number of actors are said to be considered for the role, including Dylan O'Brien (The Maze Runner) and Logan Lerman (the Percy Jackson movies, Fury). Sources also say director Marc Webb will also not return, and a new helmer for the as yet unnamed July 28th 2017 solo movie is currently being sought.